I’m in a bit of a conundrum. 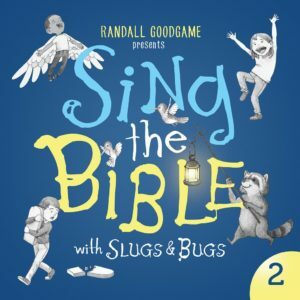 How do I tell you all that I love about Sing the Bible Volume 2, the latest album from Slugs and Bugs?! Truth be told, if you’ve been exposed to any of the Slugs and Bugs albums, you won’t need my recommendation. But maybe you’re new to the party. Maybe you’re not yet an enthusiastic supporter of all Randall Goodgame’s endeavors. That’s where I’m stuck, searching for a place to begin. I could rave about Ben Shive’s brilliant production work. There are layers of interest in every song, little rhythmic and melodic and comic nuances that make each listen a treat. I could talk about the fact that the songs are wildly sing-able. You can walk away from the album after one hearing and find yourself humming snatches of melodies. In my book, that’s huge. Then there’s the humor. Count Dracula teaches us what it means to covet, and some of the members of the Society of Extraordinary Raccoons Society swing from the ceiling fans. I could talk about the simple delight of careening down I-75 in your mini-van tapping your toes, bobbing your head, shaking your shoulders, and just generally finding yourself unable to resist the country shuffles and gospel swings. Or what about the excellent choice of Scriptures, ranging from famous passages in Isaiah to an obscure passage in Song of Solomon to beloved New Testament verses like Romans 8:28 and Ephesians 2:8-10. I could talk about the quality of the vocal and instrumental performances. My word, I could go on and on about that. I imagine we all remember the songs our parents sang to us when we were small. I could give you three complete verses of “Great Is Thy Faithfulness” right now. I don’t spend time practicing or reviewing, yet the words pop into my mind at the strangest times, perfectly preserved. Maybe it’s because the words are attached to melodies that they have a special sticking power, or maybe it’s because I learned them when I was very young. Either way, they’ve settled in, forming a kind of scaffolding for my soul. These days I wonder about the words and phrases, the truths that songs can usher into a child’s heart. I wonder what kind of foundation I’m allowing to be built in my children’s hearts, whether it’s a brick and stone type of foundation or a sandier one. I wonder what is it worth for my daughter to understand that she is God’s masterpiece. Ten dollars? A thousand dollars? I wouldn’t presume to put a price on it. One day, my daughter will face hard questions about her value, and when she does, I pray that a melody rises from forgotten places deep in her heart. May she sing, may she know, that she is the glorious masterwork of the Creator of the Universe. I’m so grateful to Randall Goodgame for helping to make that possible. Helena Sorensen grew up outside Tampa, Florida in a little backwater called Fort Lonesome. She is not making this up. As a child, she went exploring in the orange groves, searching for empty shotgun shells and fragments of broken glass. Since then, she has performed in show choirs and chamber choirs, received a degree in Music Education, written songs and poems, and traveled to Italy and Ireland. She never saw any of this coming. She also had no idea of becoming either a mother or a writer, yet here she is, living in Nashville with a husband and two kids and three published books to her name. She ponders the humor of God and the strange adventure of living while she drinks kombucha on the porch, or plans new homeschool units, or reads everything from Emily Bronte to Dave Barry to Betty MacDonald. You can find her books and an occasional poem or some such at www.helenasorensen.com. Exactly. All of this, and mostly the final part 🙂 . Isn’t it a wonderful album? I also hear the kids singing “By His Wounds” and “You Forgave me.” Makes me all teary. So true! We have a tendency to break into one of the songs any time something triggers a connection (which seems to be often). Our family does that anyway on a regular basis, but I love it when it’s songs like these. All of those things are true, and you nailed the most amazing one — a summation of all the rest. Dang, I’m glad God made Randall and his rowdy bunch. I am so excited to check out these cd’s. I just posted an article on my blog about resources for families to train up their children in the love of God’s Word and I might have to add this as a resource! We are living at seminary in the midwest and there are many young families just starting out in their journey of parenting and wanting resources. I love this stuff! Writing for the Kingdom at http://www.everymorningnewmercies.wordpress.com!